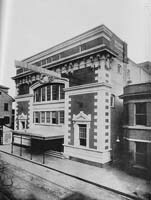 The Contractors and Dealers' Exchange, established in 1906, grew out of a number of earlier organizations dating back to 1810 and the New Orleans Mechanics' Exchange. 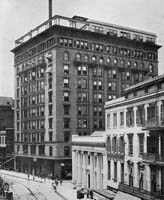 Among the purposes of the new body was to "provide and maintain an exchange in the City of New Orleans devoted to the requirements and wants of mechanics, dealers, lumbermen, contractors and other persons engaged in mechanical and industrial pursuits." 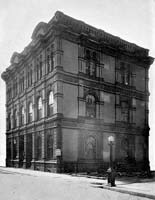 Shortly after its creation (probably in 1908) the Exchange published a volume titled Architectural New Orleans. The work includes a brief history of the Exchange along with several dozen photographs illustrative of the work in which it was involved. 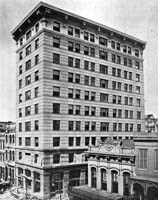 This month's Gallery features eleven of the volume's photographs showing commercial buildings in New Orleans (a twelfth offers a view of Canal Street's commercial center). We also are including samples of other content included in Architectural New Orleans: photographs of residential buildings, a church, and ongoing construction projects, along with numerous advertisements.